There are many interesting and historic houses to visit within easy reach of Hernes. The closest are listed below. Click on the names of the buildings for more detail. Also in easy reach is London, Hampton Court, Windsor Castle, Eton College, Dorney Court, Cliveden, Waddesdon Manor Hughenden Manor, Basildon Park, The Oxford Colleges, Blenheim Palace, and The Cotswolds, Bath and Stratford on Avon. On occasion, these buildings may not be fully accessibly if in use for services, weddings, concerts, recordings, repair or restoration work. Please check their website before planning your visit. St. Nicholas, Rotherfield Greys dates from Norman times, though due to major re-ordering in the Victorian era there is little left of the original architecture. The church contains an early font, circa 1200, a fine brass dedicated to Sir Robert de Grey, who died in 1387 and a magnificent monument in a side chapel to Sir Frances and Lady Knollys. In the churchyard there are some listed table tombs and an unusual brick covered grave. The Patron is Trinity College, Oxford.It is open during the day. 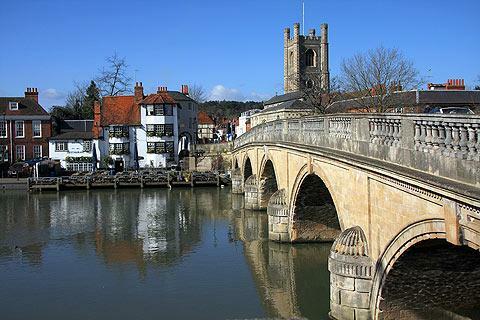 St Mary the Virgin - Henley on Thames lies beside the river and its tower dominates the skyline. The church is open daily. The Abbey is open 365 days a year, 8.00am - 6.00pm (summer) and 8.00am - dusk (winter). Entry is free.